Essential to product quality and market readiness, cleanliness testing in the printed circuit board and assembly world encompasses the analysis of a specimen to determine the “type” or “amount” of a contaminant material. This contaminant material can be potentially anything. It can be large or small; unknown, known, expected, or unexpected to the analyst or the requestor. The use of various analytical techniques for cleanliness testing can assist in determining what material is present and how much of it exists. Analysis via Fourier Transform Infrared Spectroscopy (FTIR) is traditionally conducted when an observed contaminant is believed to have an organic component. Commonly, these contaminant materials are an issue for assembly-level samples, such as materials that could lead to corrosion, resulting in a high-resistance short. In addition to printed circuit board / assembly samples, FTIR can be used to analyze any type of sample in which an unknown material is present. The testing program can also assist in assessing the consistency of the sample, quality level, and percentage of outside components. The IR radiation is passed through the material, resulting in a spectrum that serves to illuminate the sample’s unique properties of molecular absorption and transmission. 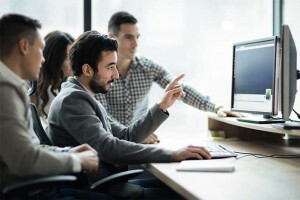 Used in conjunction with computer-generated algorithms, it’s an accurate method of quantitative analysis in identifying materials. FTIR is a non-destructive technique that can provide a superior alternative to dispersive or filter methods of infrared spectral analysis. It’s more precise and offers a mechanically simple measurement process with a single piece of machinery. Additional attributes of FTIR cleanliness testing include an increased level of scanning sensitivity and much higher optical throughput that combine to reduce the presence of outside noise. The biggest advantage of FTIR is often the speed of the process. Formerly, dispersive instruments used in cleanliness testing delivered a slow scanning process that impacted the rate of productivity in engineering and manufacturing. FTIR is so technologically advanced however, that it simultaneously measures all infrared frequencies through a unique signal produced by the interferometer. Because the signal can be measured in a matter of seconds, the process is reduced to a fraction of the previously acceptable norm. Although FTIR is typically a self-guided analysis, IPC has developed some test methodology to assist in the “cleanliness testing” analysis of printed circuit boards and assemblies. Analysis via Ion Chromatography (IC) provides cleanliness-related data for specific ionic species selected for testing. Similar to FTIR, certain ionic species of interest can lead to corrosion or cause electrical performance issues. The data obtained through IC cleanliness testing can be used for comparison to known requirements, for establishing process “control,” or for investigating a broader Failure Analysis topic. IC testing delivers precise qualitative and quantitative determinations regarding the material identifications of positively and negatively charged ions. It’s commonly used in trace analysis of soil, water, and drinking water samples to discover contamination. IC is also an effective test in determining halides from pyrohydrolysis extraction. Ion Chromatography can separate and detect trace ionic species and other substances ranging from silicates and carbohydrates to amino and weak organic acids. One of IC’s key advantages is the ability to analyze molecular species rather than focusing on present elements. With this method of cleanliness testing, it’s possible to determine the quality of all types of molecular materials and minerals, as well as the purity of everything from food and drink products to soil and water samples. Using these methods, IC allows for the determination of ionic concentrations “on” or “within” a specimen for use in control/characterization studies or failure analysis based testing. The tried and true ROSE method provides an “in-line” or, simply put, a “quick and easy” quantification of overall printed circuit board/assembly cleanliness. ROSE can obtain a “singular” value for evaluators. Performed with a simple resistivity (or conductivity) meter, the ROSE test provides a quick assessment of overall cleanliness and is a tool that has been used by process engineers for decades to help check and/or establish process control. ROSE cleanliness testing is typically employed as a method of quality control in manufacturing printed wiring boards and printed wiring assemblies. These specific types of electronics undergo chemical and mechanical processes that tend to put residual stress on the components or somehow change the characteristics of the materials. When conducted by a capable and experienced technician, ROSE testing can effectively analyze and identify any failures or unintended residues resulting from the manufacturing process. ROSE is among the oldest and most proven testing methods utilized in the electronics industry. The method involves the immersion of a sample in a room temperature isopropanol and deionized water solution at variable immersion times no less than 10 minutes in duration. As a process control tool, ROSE measures conductive materials present after printed wiring assemblies are processed with rosin-based fluxes. ROSE is the workhorse of cleanliness testing because of its many widely recognized advantages, not the least of which is its overall low production cost. It has been successfully called upon for decades and is among the only cleanliness test of its kind that is efficiently reliable as a process control tool in a production line environment. Other positive attributes of ROSE testing include its ability to demonstrate gross levels of conductive materials and its non-destructive properties when testing materials that are not susceptible to IPA or water. The industry standard for this analysis is IPC-TM-650 Method 2.3.25 – Detection and Measurement of Ionizable Surface Contaminants by Resistivity of Solvent Extract (ROSE). SEM/EDS analysis is typically paired with the FTIR technique described above to investigate an observed contaminant that is believed to have an inorganic or metallic component. The SEM/EDS technique provides both visual and elemental information about an area of interest. SEM gives a different view of the “unknown” material being analyzed, while EDS provides elemental information. Combined, the SEM/EDS technique is commonly used to investigate “failures” as well as simple “unknown” material in order to determine the composition and possible origin of the substance. Often used to generate in-depth, high-resolution images of surface topography, the combined SEM/EDS testing method is also valuable in a wide variety of production and engineering processes. Potential applications range from providing precision imaging of corroded copper surfaces to analyzing the composition of metallic commercial products. It’s a highly effective, non-destructive method of surface analysis that’s fast, economical, and applies itself to myriad applications. This high tech cleanliness testing is a powerful form of analysis that can provide elemental data in many different ways. Depending on the position of the electron beam, our lab can generate localized elemental information; plot proportions of identified elements along a spatial gradient, or map the distribution and intensity of elements in a sample area. 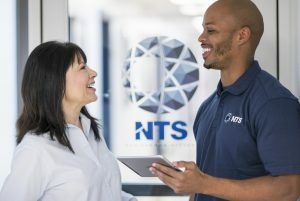 NTS is among the largest testing laboratory networks in North America; providing a complete range of cutting edge services. We offer fast, accurate, and efficient FTIR, IC, ROSE, and SEM/EDS cleanliness testing delivered by our trusted team of technicians. Need information on specific test programs? Click or call anytime! We’ll be happy to assist you in analyzing your needs and provide a free, no obligation quote.